In case you didn't know Aqiqah is an Islamic ceremony whereby a parents will sacrifice an animal as a sign of thankful for a newborn. It is not mandatory but highly encourage. In our case, we had sacrifice a goat for our daughter and invited guests for lunch. In accordance to the Aqiqah, we did Marhaban and Cukur Jambul (both also not mandatory, more to a tradition). Marhaban is where a group of people will praising Allah's for gracious in rhythmic. Cukur Jambul is an occasion in Malay tradition for a new horn first haircut. 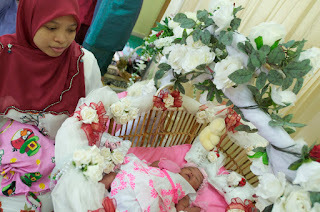 This been done while Marhaban take in place, together with few items been splattered on the baby. People will take turn removing few hair locks from the new born and after the ceremony, the whole hair will be shaved and weigh in. The hair weight will be used to transfer in the price of gold to be given to the needy as an alms. 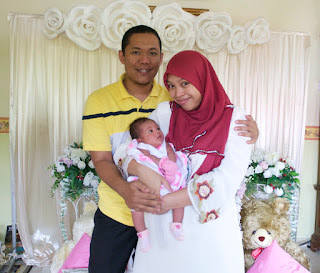 Rauhah's Aqiqah happened on 1st September 2012 which I am still on my pantang days. Food catered by Haji Lazim, someone that Ayah knows and we have been ordering his cook since my engagement days. We had white rice, mixed vege, lamb curry, ayam masak merah, masak lemak nangka, sambal belacan and ulam. There's dessert section where Umi ordered egg tarts, make pulut kuning with kari ayam, agar-agar, bahulu by Mama, bubur kacang courtesy from Haji Lazim, and muffin courtesy from Umi's friend. No food pictures since everyone was so busy handling guests and the event itself. The only picture that we have is only during marhaban and cukur jambul. 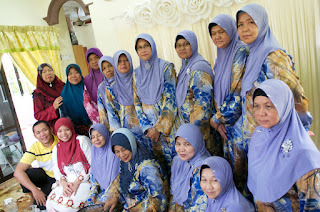 Her pelamin was by someone that Umie knows, a very last minute decision. As for myself,I prepared the goodie bag with jelly and candies, Umi bought bunga telur and Mama prepared the pulut manis. In my hometown, they have their own committee that handles marhaban, Yaasin recitation and cukur jambul. Thus, Umie just invited them for that day session. It started at 10am with the ladies recite Yaasin, followed by berendoi where they perform some poetry while the baby in baby swing (Malay tradition again), Marhaban and the last bit was the Cukur Jambul session. Rauhah was sleeping and everything was fine, until she wakes up in the middle of poetry. Syair die haru tau, tersentuh jiwa dengar macik-macik ni nyanyi. Tak ingat sangat lirik tapi memang meruntun. Aku baru feeling dengar ayat-ayat syair tau, tetiba bangun pulak nak susu. Luckily drama tak lama sangat. Give her milk and she's wide awake! That day was a very hot day and I'm afraid Rauhah is going to get fever due to the hotness and tiring day. At the end of the day, I ensured she get herself clean (just wipes her with wet towels), get enough direct breast milk, and sleep well. 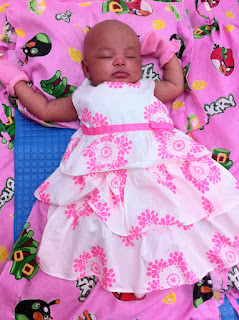 Alhamdulillah, she's a healthy and cheeky baby on the next day, though I feel weird looking at her bald head -_-"